Tiger Wrench is a wrench you can easily adjust while you are using it. Instead of reaching for different wrenches to help you with three or four parts of a single job, just adjust the angle and the tip, then use this single tool anywhere. You can use any size standard or metric, just flip from one side to the next as simple as that. Hold it in the center and work on any angle. The cost of Tiger Wrench is $19.95 plus $9.95 shipping, for a total price of $29.90. Tiger wrench is a powerful new tool that combines 16 wrenches in one. Using a swiveling head and a rotating adjustment you are able to find the size you need quickly no matter the angle. This one unit replaces bulky socket and wrench toolkits. Alleviating any guesswork means that you save time. It will work with square, six-point, 12 point or even damaged bolts. One end is standard while the other end is metric. In the middle, you will find the ergonomically friendly handle that you can grip easily. Tiger wrench is a uniquely designed tool which combines 16 different wrenches in one. This makes repairs quick and easy. By clicking on the different sizes you will instantly have whatever tool you need for the job on which you are working both standard and metric. Fast when you need it, always have the right tool. You can click the tiger wrench to a 45° angle in order to reach difficult nuts and bolts. As a thick, heavy duty and professional tool it is able to tackle all of your projects on the job, or in your house. The tiger and just perfect for every angle. Working on a skateboard, bicycle, under the hood of your car, on a tractor tire, under the sink or toilet, even the corners under a table are easy with this tool. If you do not already have a full socket and wrench toolkit, using this one tool save you a great deal of money that would otherwise go into purchasing a large kit. Using this tool will save you time insofar as it alleviates the time you will spend searching for the different wrenches. Also, it alleviates the time you need to try and struggle with a unique angle while working. For people who are doing a lot of jobs at home or at a job site, having only one tool versus 16 different tools save you time. Time that would otherwise be spent searching for the right tool or continually switching tools depending on the job. Transporting a large toolkit is a lot more difficult and time-consuming by comparison. The Tiger Wrench is an innovative new tool that combines the power of 48 other tools all in one. With this product, you will be able to tackle dozens of projects around the house, on the road, in the garage or even at work. This wrench has both metric and standard sizes ensuring that you always have the tool for the job. A tool that is meant to work with spline bolts, 6-point, 12-point, Torx, square and even damaged bolts. There is virtually no nut or bolt that this tool is not designed for. Tiger Wrench allows you to take the guesswork out of finding the right size socket for the job, ensuring easier and quick fixes to your problems. This wrench is a heavy duty, professional tool that is well made and durable and is even designed to withstand up to 300 pounds of torque. Also comes with a lifetime manufacturer's warranty so you do not have to worry about breaking your wrench in the future. If at any time, you tool breaks or gets damaged, simply return the product for a replacement. Tiger Wrench has multiple different ratchet sizes and with its specially designed teeth, it is proven to not slip. Simply flip the tool around and you have even more sizes. Standard wrenches can be hard to get in tight spots. With its versatility, the Tiger Wrench can even reach nuts and bolts at a 45-degree angle. Similar to the Tiger Wrench and comes with a Husky lifetime guarantee. Includes twelve commonly used 1 / 4" drive bits, 68 different fasteners and a LED light that fits into its largest socket. The Dogbone Metric wrench has 8 different wrench sizes. 12mm, 13mm, 14mm, 15mm, 16mm, 17mm, 18mm, and 19mm. Includes 16 standard and metric socket sizes and is also backed by a lifetime warranty. This tool replaces up to 65 other sockets and has both standard and metric sizes. This socket is a self-adjusting tool that fits most standard and metric size nuts and bolts. Tiger Wrench has a special limited time double offer right now. If you buy two wrench's you will get the second one at a discounted price. This offer also includes free shipping. This product is not available in store and must be ordered online or by calling. Tiger Wrench is not an insulated tool and should not be used around live electric circuits. Always use caution when dealing with electricity. 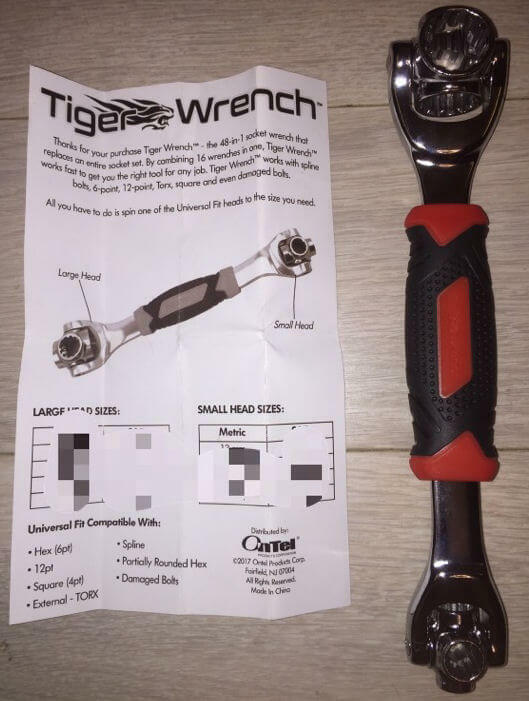 The Official Sales Marketing page TigerWrench.com was first registered on November 28th, 2016; however, only came online in its current state (As Seen on TV) in late November of 2017. Certain As Seen on TV items feature the option to enter a promo code. This code is not widely known but can be easily obtained by conducting a quick search online. Typically these codes are $5.00 off the entire order. The reason these codes are easily obtainable is because it is a sales gimmick which allows the customer to believe that they are getting a deal and somehow have gotten 'one up' on the seller by finding a promo code. The Tiger Wrench office sales page does not accept promo codes, nor do any exist for this product. 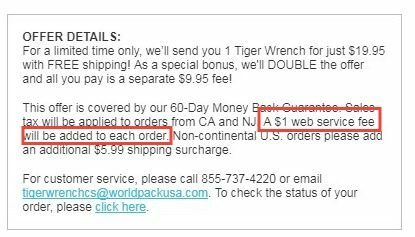 We bought a Tiger Wrench from the official sales page and after clicking the "Process Order" button, we received six additional special offer requests. Each request appeared one at a time on its own page and we had to accept or refuse each request before eventually getting to the purchase confirmation page. - We were offered to receive a second wrench for only $19.95 with no processing or handling charges. Further, we could select the quantity of how many wrenches we would like to receive at this price. This didn't seem like a good deal, as before pressing process Order, we could have chosen to receive a second wrench for free with only having to pay an additional $9.95. - Once we said no to the first offer we were presented with a second offer to receive 25% off of an additional Tiger Wrench plus pay no processing and handling. While this deal was better than the first offer, it was still worse than if we had selected to receive the second wrench on the main page when entering our initial order details. To our surprise, they never again offered to provide an additional wrench by only paying $9.95; so our advice to you is if you wish to receive two wrenches, select it from the beginning before clicking the process order button. - This offer was a little concerning as it made us think, is the wrench not already made of professional grade material that is corrosion resistant? Should I be worried? Wait, what is Professional Grade Material? It sounds like something that was just made up and could be applied to any material without balances or checks. - After declining the upgrade, the next page offered a 50% savings allowing for the upgrade of each wrench at a price of $5.00 per wrench. I feel sorry for the people who upgraded at the full price when all they had to do was click 'no' the first time they were asked. - SpeedOut is a drill bit set which allows for the removal of stripped bolts or screws. It is actually quite a useful tool. If this set was offered at a discount we may have considered adding it to our order; however, it was offered for an additional $19.95 with no additional shipping fees. We were able to find SpeedOut available online for less than half of that price with shipping included. - The final offer presented to us was for $6.95 which would expedited the handling process so that rather than it taking 1-2 weeks to be processed at their warehouse, and 3-6 weeks to receive, the order would be placed at the top of their shipping list and would be sent out from the warehouse in 3 to 5 business days. At first glance, the offer sounded good, $6.95 for expedited shipping (at least that's what I thought was being offered, boy was I wrong). There was even a picture with a box on it that said 'Priority'. Any time I've had something sent to be via priority mail its received within 2-3 business days. Lucky I re-read the offer and noticed that all which was being offered was to expedite the handing time, not the shipping time. This meant that the same shipping method would be used and it would still take 3-5 business days (3 to 7 calendar days) to have the order even mailed from the warehouse. There was no change in the shipping method. There have been a number of complaints regarding buyers having not received order confirmation. Once you click past the 6 additional special offers, you will arrive at the final order summary page where there will be a Yes / No radio button which you must click if you want to receive an e-mail confirmation of your order. If you get partway through your order and decide there is something you would like to change, and you go back to the main page to select to receive a second wrench by only paying the shipping price, you will be completing an entire second order. On the very first official sales page there is fine print below the order button which says " By clicking Process Order, your credit card will be charged the amount above. Click only once." Do not go back to the main page to make a correction as you will be placing a whole new second order if you do so. The aforementioned is the only aspect of the website we found the average customer may use improperly and end of being charged more than they expect. Traditionally, As Seen on TV Official Sales Pages are confusing; they aim to trick the buyer into spending more money than they realize by using confusing language and not providing an opportunity to see/confirm the order. The Tiger Wrench sales page is not confusing at all. The 60-day money back guarantee refund policy does not include any shipping and handling fees, nor the price of return postage. Regardless, unlike other TV products, the shipping fees are more than reasonable (in some cases free); thus making the return policy optimal. TigerWrench.com's shipping policy states that they will ship your order within 60 days from the time it is processed and it will be mailed via Fed-EX Smart Post. This massive timeframe is to account for periods of backorders, increased demand or any other unforeseen problems. The above wrench has a different handle with an engraved rectangular plate within. It also appears to have a non-confirmed grip (not dog bone). It is possible that these could have been initial designs for the tool. The above photo shows a much cheaper quality wrench which has no metallic marking on the handle. Further, the handle is a straight rectangle without any gripping contour. The reason we are hesitant to call these two versions outright knock-off is because knockoffs usually don't have the name of the item on them. Further, these alternative wrenches are being sold in other countries at a rate equivalent of $29.96 - $75 USD plus shipping and without any special offers. Counterfeit products are usually available at a much lower rate than the original as they do not have to follow the same regulations and are not concerned with protecting their brand name reputation. This typically results in counterfeit items being made of lower quality materials. The idea of a 48-in-1 wrench is not original. A Brand called EZ Tools released their version of this invention over two years ago. If you do not already have a QVC account, you can enter the following promo code to receive $5.00 off of your order.
" Most countries use the Metric System, which uses the measuring units such as meters and grams and adds prefixes like kilo, milli and centi to count orders of magnitude. In the United States, we use the older Imperial system, where things are measured in feet, inches and pounds. " " Both sizes have their respective benefits, although some who frequently use sockets may swear by one or the other. Generally speaking, a 6-point socket gives the user less room for error. That is to say that due to the restrictive shape of the socket's interior, only the correctly-sized socket will work for a particular bolt. The benefit of this is that the right socket fits snugly onto the bolt. There is no danger of rounding the bolt's head with a socket. On the other hand, a 12-point socket more closely resembles a circle on the interior, so it is easier to fit a socket onto a bolt. It's not so much that it's easier, it's that there is more wiggle room. A 12-point socket has twice as many interior points on which it can fit around the 6 corners of a bolt head. What this means in a practical sense is it is possible to use a 12-point socket that is not exactly the right size on a bolt. A good example of this is using a 12-point metric socket on a standard bolt for which you do not have the correct fitting. The 12-point socket will give you some leeway and allow you to loosen or tighten the bolt. The disadvantage of this is that there is a danger of rounding the bolt head, something that cannot happen when you use the right 6-point socket. " This wrench is different from the others as aside from replacing the 48 wrench/socket tools, it also has an interchangeable head which allows the unit to be turned into a screwdriver or theoretically any other handheld fastening tool. An added novelty to this wrench is it contains a miniature flashlight which can be easily attached to the largest socket head. The main function missing from the Tiger Wrench, and all other alternatives, is the ability to ratchet. 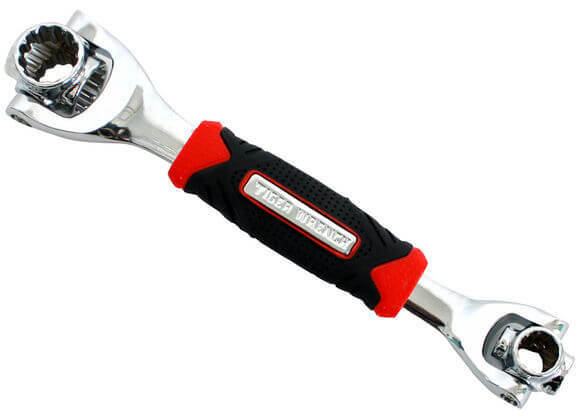 Unfortunately, there is no tool anywhere on the market which acts as a 48-in-1 wrench and has ratcheting functionality. There were multi-function ratchets (although rare) that have the ratcheting capability; however, they are only available in either SAE or Metric, but not both. This is a problem as if some equipment is made in the United States and other items are made in China, this means you're likely to need both Metric and Standard ratchets. We've spent countless hours researching both the Tiger Wrench and available alternatives so that you won't have to. (of course feel free to) We've found that the Tiger Wrench isn't the only option out there, nor is it the cheapest, first, or the best. However, it is the wrench that is As Seen on TV, so if you are buying it as a gift you'll be missing the novelty if you buy a different wrench. If you're buying the multi-wrench for yourself, there are better options such as the Kobalt Multi-Drive for reasons listed above. Does the Tiger Wrench do as advertised on TV? Of course, it does or else the company would open themselves up to lawsuits. Is the online sales page confusing? No, although they try to offer "not so special" offers throughout the check-out process, if you read before you click, everything is straightforward. By taking all factors into consideration, be it the price, quality, functionality and what alternatives are available, we've come to the conclusion it is a good buy. Do not buy Tiger Wrench online before searching Amazon. If I could rate this a 0, I would. I ordered this way before christimas and today they want to charge me for it. Almost 4 months later. I tried and tried to speak with someone about cancelling my order, by email and phone. Today I finally spoke with someone and she stated that I would get a full refund. She said I could check my status on my order and it would say that a refund is being issued. Well, when I check my order status, it is saying order not found. Imagine that! I will never deal with that company again. Not worth a damn! I received an e-mail that my order #24272215 is complete. When will I receive it? I ordered the Tiger Wrenches on 12 / 14 / 2017. Your on line order tracking does not work. My experience with that company is also like the others. Thanks. I ordered one Tiger Wrench and was charged with an upgrade but never received any at all. I just got ripped off in the amount of $30.90. I also placed order on December 15 for double deal on wrenches for Christmas gifts and have got nothing delivered as of Christmas night. There is no way to track my order even though ya click on track order gives ya a customer number that doesn't tell ya anything! Emailed company that I wanted my delivery that my credit card has already been charged. Of course no reply from customer service. Even few days before Christmas. I want my dam money back on my card and they can still deliver my stuff. Cause I am very pissed off with this. I placed an order for the Tiger Wrench double order ( as seen on TV ) on December 13th I received an email stating that my order was complete and ready for shipment which I paid extra for because it was ordered for a christmas present, I finally got through to customer service after being shoved around to different departments and then when I requested information about my order I was told they do not have any product in stock and will not be getting any for 6 to 8 weeks! I told them what they could do with there multi position Tiger Wrench and cancelled the order and gave them a ticked off warning that it better be cancelled because if I see it deducted from my account I will be filing with the bbb! The whole process is a scam! So, I was going thru the purchase of 1 product. Suddenly as I am finishing up, one after another thing pops up to upgrade this and that and the other, I keep saying no. Finally I back out to just cancel the whole thing. Later that day I get a confirmation email that charge me for not 1 but 2 wrenches which now comes to $2$9.95, some $9.95 Separate bonus fee, and a $1.00 internet usage fee. What the crap! Now it is saying 6 weeks to deliver on top of this. Buyer beware. You can't just back out of the sale. As soon as you lick process order, you are doing just that, processing your order. Lets see - there are 4 different sized sockets on one end 4 sockets on the other end. Now you really got to be a moron if you think that 4+4 can replace 48 wrenches. But if you want to be a sucker go ahead and buy one. They state they are replacing 48 tools, not wrenches. I guess I'm a sucker for being able to pass grade 3 math. I ordered 3 Tiger Wrenches. The lady talked me into an upgrade to professional grade Tiger Wrenches with LED lights. The wrenches arrived today and they're just plain Tiger Wrenches with no LED's. Guess I been ripped off! I ordered to many of the wrenches and I called right away to change the order and I was told to call the next morning and they would change it for it took 24 to 48 hours to process. They lied. It went out the next da and charged my card and all I heard was sorry. Be careful on what you order they do not keep there promises. Also they charge $1.00 for internet use that you are not told. It states on their main page that you will be charged $1.00 for internet orders.